The all-new G70 compact performance sedan is the third vehicle in the Genesis lineup, alongside the midsize G80 and full-size G90 sedans. It's intended to pull down the age of the average Genesis driver ? the maker expects it will be bought mostly by people in their 40s. There are two engines available: a 2.0-litre, turbocharged four-cylinder and a 3.3-litre, twin-turbocharged V-6. Both are mated to an eight-speed automatic transmission and all-wheel drive, but the smaller engine is also available with a six-speed manual transmission and rear-wheel drive. That single RWD model, called the Sport, has an MSRP of $45,500, but it's not the least expensive edition, being equipped with Brembo brakes, a mechanical limited-slip differential, performance trims, high-end leather seats, a thumping 15-speaker sound system and a heads-up display. It's intended as a track car, though it's not that quick. The 2.0-litre engine makes 252 horsepower and 260 lb-ft of torque, while the 3.3-litre V-6 makes a more impressive 365 hp and 376 lb-ft. Both are mounted on a stiff chassis that's tuned for performance, with active damping available for the top-trim 3.3-litre. The base model 2.0-litre sells for $42,000, which is a fixed price that includes freight and PDI, as well as five years of scheduled maintenance. The only additions to the price are taxes. It includes driver's assistance features such as blind-spot warning and adaptive cruise control, but also an eight-inch touch-screen unit with Apple CarPlay and Android Auto, as well as heated front seats and a heated steering wheel. There are four more trim levels with additional features, rising all the way to the 3.3 Sport at $57,500. 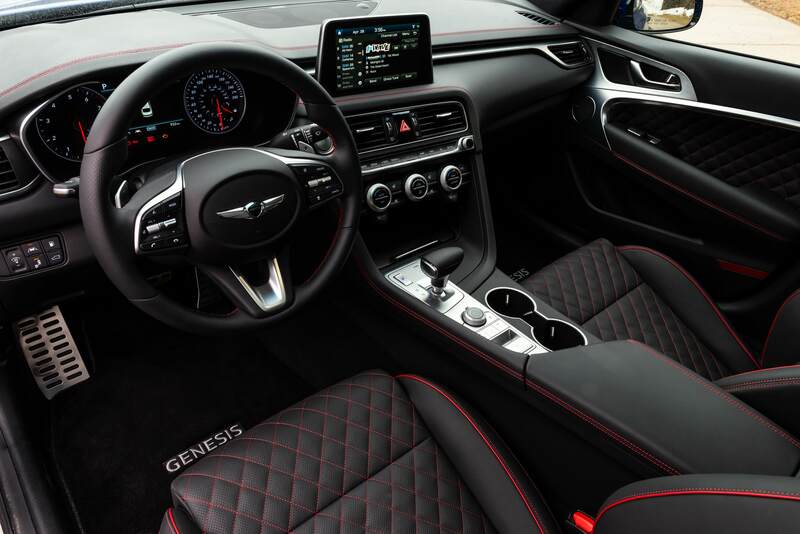 At that level, there are adaptive headlights for cornering, diamond-stitched quilted Nappa leather seats and 19-inch wheels, as well as pretty much everything Genesis can think of for comfort and convenience and performance. The more powerful G70 covers zero-to-100 km/h in about 4.8 seconds. 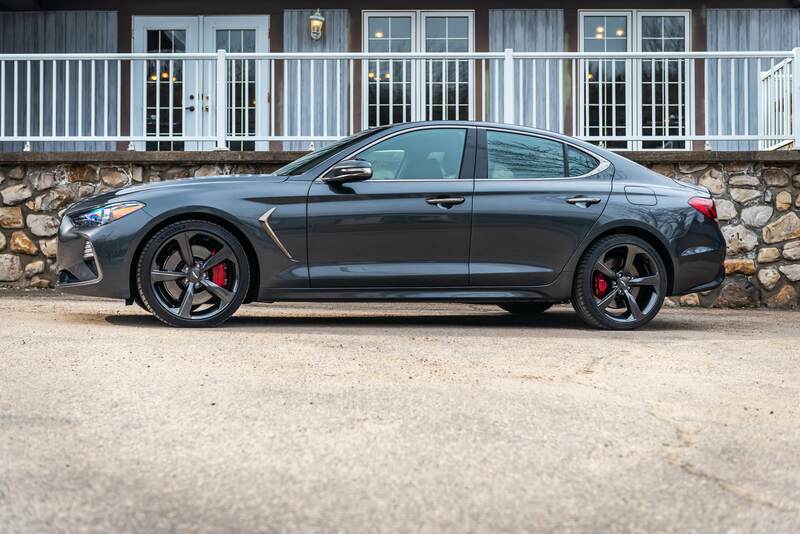 Genesis says the G70 competes directly against the BMW 3 Series, Mercedes-Benz C-Class and Lexus IS, while the Audi A4, Cadillac ATS and Infiniti Q50 are also in its sights. At 1,850 millimetres, the G70 is wider than any of those six, and at 4,680 mm, it's lower than half of them, too. The unnamed competitor, though, is the Kia Stinger from Hyundai's sister company, which shares its platform and much technology with the G70, including the AWD and the 3.3-litre V-6. Its base model starts at about $46,000 after freight and PDI.